This post has been shared by travel blogger Katie who spent February and March 2013 travelling around Europe. You can catch-up with her on Twitter. 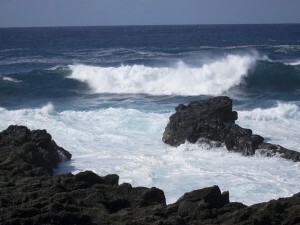 Let’s face it; the good weather is what attracts most tourists to Lanzarote. The island is full of resorts and hotels hosting people who never venture out to enjoy what the locals offer. Granted, to enjoy the island fully you will need to hire a car, or book yourself onto a tour bus. However, if you stay in Playa Blanca, you can still enjoy what the village has to offer without the need for wheels. There are many high-quality resorts in Playa Blanca, many of which offer “All Inclusive Service”. It’s really tempting to stay there all day, enjoying the weather but having nothing to do with the rest of the island. If you do, you’ll be missing out on some memorable, if simple, moments. I’ve made Playa Blanca my favourite holiday destination and even though I now always hire a car to take a drive to Salinas or Papagayo, I continue to spend time in the area. Here are some of my favourite moments. Il Nuovo Gelato is a lovely place to sit down and have a coffee, ice cream or any other sweet temptation that you fancy. If you have a sweet tooth and are in the mood for a coffee, make sure you have a café bombón: coffee with condensed milk. From there, you can also buy an ice cream to enjoy as you go for a walk down the seafront. 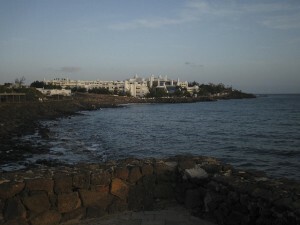 From Playa Blanca, you can walk east towards Marina Rubicón, which is quite a nice walk. But if you prefer to leave all the shops and restaurants behind, it’s much better to walk west, especially in the late afternoon as the sun begins to set. There’s something to be said for the way in which the seafront has been developed when you walk west of Playa Blanca. It has been beautifully paved but there are no tacky restaurants or shops to be seen. In fact, some of the land remains undeveloped, so you can really enjoy the feeling that you are surrounded by nature, albeit in a very civilized way! Going west you can really enjoy the vastness of the sea and only be reminded of the fact that you are in a touristic area when you pass some of the grand hotels or resorts, such as the H10 Rubicon Palace which has been built right by the seafront. It’s the perfect walk if you are into sunsets: if you are watching the sun disappear on the horizon, don’t forget to turn around 90 degrees, you might just be lucky enough to watch the moon rise. It has almost become a tradition of mine to go for a cocktail after dinner. There is something so special about sipping a delicious drink by the sea. There is a small cocktail bar, Dorada Nights, at the end of the Calle Janubio. If you are walking down the seafront, it’s half way between Playa Blanca and Marina Rubicón. If you are coming from the town, you can walk through the car park next to the Princess Yaiza hotel. There’s a little path that takes you straight down. If you don’t drink alcohol, there is a small choice of non-alcoholic cocktails and drinks. For something a little bit different, have a Ron Miel with cream, the honey-based liqueur typical of the Canary Islands, which will leave you with a memorable taste of Lanzarote by night.